Even in the ocean, fish numbers can fluctuate during dry times. DROUGHT arrives gradually. Even though we had a cyclone last year and some good rainfall since, the lack of water soon has an effect. By the time a drought is declared farmers are already doing it hard. Extreme drought leaves dams and riverbeds dry, livestock dead and a parched landscape where green pasture once grew.While we might face annoying water restrictions the reality for those on the land is far worse. Drought seems endless. Each day is blue sky perfect, but everyone wants rain. We now know a prolonged spell of dry conditions is related to the El Nino effect. This means Australasia receives well below average rainfall. The Southern Oscillation Index is used to assess the strength of the El Nino. A negative reading of seven or lower means things are going to be dry for a while. Farmers in desperate need of rain know that once El Nino is in full swing the chances of early salvation are slim. When it does rain, the ground soaks up the moisture and little runs off. Even heavy down pours do little to redress the overall lack of ground water. The other extreme is known as La Nina which brings wetter conditions. This occurs less frequently than El Nino but is welcome after years of drought. Of course, we are then dealing with floods. For anglers, seasonal fluctuations in fish numbers are a constant. The cycle of feast and famine that we are all familiar with is shaped by many factors. Some variations during dry times may not be linked to El Nino at all. In 2018 the by-catch taken while marlin fishing wide off the Gold Coast has been poor. Wahoo and dolphinfish form the mainstay of other captures and we rely on a few fish to keep food in the freezer. Fortunately, the blue marlin fishing has been reasonable, but it will be interesting to see what happens once the dry spell breaks. The lack of wahoo and dollies may well be because of the drier conditions but it is impossible to say for certain. On the other hand, mulloway have put in a strong appearance in 2018 with many anglers getting good fish. It is convenient to blame the dry times for poor fishing. It is probably sacrilege think the dry is great because the jewie fishing has been hot. What we do know for sure is that dry times make significant changes in parts of our fishery. In rivers, estuaries and canals the water goes clear. At first this is great with good lure casting conditions. Soon it becomes a curse as fish get shy and increasingly difficult to catch. In my local lake the dry spell allowed the water to clean up to such an extent you could see the bottom in most areas. It would have been an ideal time for the council to clean out dumped shopping trolleys, bikes and crab pots. I did my bit by recovering some lures snagged on a bridge. The absence of rain means no run off and river flows are reduced. This allows saltwater to penetrate further up the rivers with each tide. In droughts, saltwater reaches well beyond the mangroves to where it is normally brackish or fresh. If a prolonged drought persists, fish kills may occur as well as blooms of algae and other unusual and unwelcome events. In the cooler months of most years, there are normally good runs of flatties and jewies in the local rivers. The bigger winter mullet also swarm into the upper reaches with jew and sharks hot on their tails. In dry years, it is surprising how far upstream these predators will travel. It is not unusual to encounter them in what most would regard as freshwater reaches. Barriers designed to control saltwater also block these fish and can become short term “honey holes” for those in the know. Even though the fish are well upstream, the clear water makes them hard to catch. One solution is to work deeper sections focussing maximum effort over tide changes. An early morning high is ideal, but any change is worth a few hours effort. The other time is to fish is a tide change at night. During drought, flatties and other estuary species are often found much further upstream than usual. Flatties are easy to catch on a variety of lures and baits. Vertically working soft vibes while slowly drifting the drop offs and deeper holes is a good way to collect a feed. Many fish are undersized or just legal but the odd 60 cm fish is always present. They bite throughout the tide but often get far more active as the tide reaches full. The key seems to be finding bait and drifting that area repeatedly. Bream are always mooching around, and they can be targeted over a wider range of structures. Rock walls, overhanging trees, rock or gravel bars, bridges and deeper holes are all attractive to bream. Australian bass are also commonly hooked when using small to medium deep diver lures or surface poppers and stick baits. Jacks are already living in these reaches and some move higher in dry periods. Areas that barely register tide changes become ideal jack habitat. They take up residence under fallen trees and riverside snags and make life very dangerous for bait and prawns. 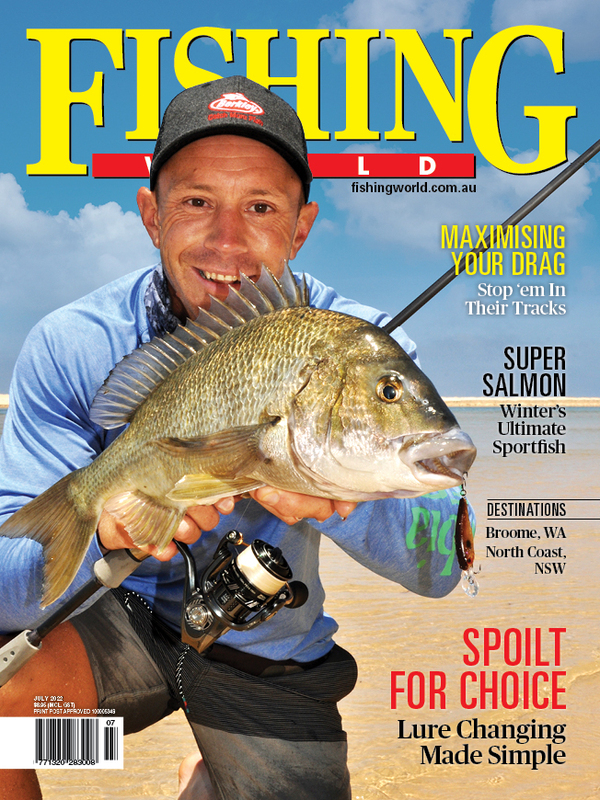 One angler I know has taken jacks, bream and bass from a set of snags high in a feeder stream south of the Gold Coast. Jewfish are a realistic proposition for those prepared to work tide changes and low light periods. They will take a soft vibe, soft plastic or a micro jig if it is worked near the bottom. Live baits like herring and small mullet are very effective. In my experience jew tend to swim through an area feeding as they go. A school may hold in a deeper hole, but they don’t seem to hover in one spot for long. Work the areas where bait is holding and ambush them as they sweep in. After dark jew will chase mullet on the surface. Over-water lighting is a good area to focus on but any area that attracts and holds schools of mullet will also attract jewfish. On cold winter nights jew will repeatedly smash baitfish but mostly ignore lures. It is amazing to see these secretive fish throw caution to the wind and hunt on the surface. High tide is a good time to be on hand. They sometimes fall to a well-placed fly or lure twitched through the zone but for best results an unweighted lightly hooked mullet allowed to swim freely around the school is the best approach. With more river available thanks to the dry conditions, running with the tide is an interesting way to approach finding a fish or two. This involves working one area as the tide reaches high, then blasting upstream to the next spot to catch the tide change there. I’ve found you need to be on site about 40 minutes before the change. This requires a good knowledge of suitable areas and the time delay between tide changes from one area to another. Different tides create different time differences. In my local river, this method works well as there are a series of deep well-spaced holes. When using this method on smaller tides, the change isn’t always obvious. The surface is still running one way, but the water level is indicating the tide has changed. Fortunately, the tide “push” is often marked by one or a series of lines of debris riding on the leading edge of the surge. Typically, you will notice a “front” of leaves, foam and driftwood moving quite quickly upstream. The run increases and it’s time to do one more drift then go. If you relocate too late the next hole will already be running and it may be necessary to go on to the next. This means leaving on time and not becoming distracted. Work each hole using a few drifts and vertically jig your preferred lure. I like Zerek Fishtrap 95 soft vibes, 100 mm soft prawn lures on a 20 g jighead and a micro jig in 20-30 g. These are rotated if time permits. The pace of the tide change dictates the number of drifts you can fit in. Focus shorter drifts on bait concentrations or the leading edge of the hole. Work quickly to take advantage of the first hour of the tide surge. At the lower end of the river the clear water makes day time fishing hard. At night things can improve with jewfish feeding on mullet schools. Back eddies, bridge pylons and other features that hold the big schools of mullet attract jew. Some nights there seems to be dozens of big silver predators lunging at the mullet. The tide effects anglers in the lower reaches as it runs far harder. The tidal “window” can be short. One bloke I spoke to recently had lost 10 jew in a row. Being shore based he was seriously hindered by the apron of rock he had to work over. However, this was the feature the jew jammed the mullet up against while feeding. The fishing “window” was quite narrow with 20-30 minutes all the tide allowed. He had regularly hooked jew on big shallow running minnows and swim baits that had been too large to control. I hope he gets a few before he goes broke buying $60 swimbaits. Boat-based anglers can access areas shore based fishos cannot reach but still run the gauntlet of snags, dolphins and sharks. Other anglers chasing bream or squid can also ruin an area by blundering around with all their lights on and engine roaring. This really puts the fish off. If you can tolerate early morning starts or little sleep, the tide changes at two am or later are a favourite for those seeking solitude. The lower estuary is also more likely to produce squid when things are clear. Calamari and arrow squid are rarely abundant in our SE Qld estuaries, but a high tide change in the early morning along with wind free conditions can result in some good squidding. We prefer low flow areas featuring shallow weed beds. It doesn’t take long to discover if they are around. 10 minutes flicking jigs in several colours and sizes will reveal any feeders. One species that seems impervious to clean water is the luderick. If the water is crystal clear, then work deeper areas along rock walls and drop offs. Long fine leaders are also going to get more bites. I like to have a mixture of sea lettuce and marine weed on hand to have some bait choice. One of my mates uses slimy weed from a freshwater pond and does very well. It pays to experiment. Like the other species mentioned luderick will also travel far upstream and recently I have found good numbers of larger fish in areas that are fresh in a wetter year. These fish are “next level” shy. Low water levels due to drought and mismanagement can in extreme cases lead to fish kills, as we have seen in the Darling River recently. Dry years affect freshwater dams in several ways. Irrigation impoundments release water for farming mostly in the warmer months. The dam then refills through the remainder of the year. Low water levels are the inevitable result in drought years where the refill phase does not occur. Long term low levels can promote weed growth because sunlight can penetrate the shallows. Weed banks support lots of bugs and small fish and are worth focussing on. Long periods of stable water levels can also promote bank revegetation with fast growing saplings shooting up. On the next fill, these twiggy forests are covered by water and die and can be hard to fish. Differences in water temperature can cause the dam to stratify or even to roll. This is where surface water is replaced by water from the deeper areas. This can cause muddy conditions and extreme cases it can also cause fish kills. Dry years are an ongoing challenge. It’s never easy to say with certainty what constitutes a normal year, but a prolonged dry spell certainly impacts on fishing cycles. Some species are strongly influenced by a lack of rainfall and run off while others take advantage of the conditions. Adaptable anglers can still enjoy great fishing by identifying what is thriving in the parched conditions and focussing on working the clear water and extended river habitat. Freshwater river anglers should check conditions carefully before committing to a trip as the drought may cause very poor fishing in some waters. Of course, we all hope the El Nino eases soon and those who rely on the land for a living can return to normalcy. Droughts arrive slowly but can be broken in days. Drought can cause challenging fishing in many rivers.